The Mercedes-Benz 2018 GLA250 crossover. Sales of luxury crossovers are hot, and Mercedes-Benz wants to keep its place at the party with a freshened version of the GLA entry-level crossover in 2017. Mercedes unveiled the 2018 GLA on Sunday on the eve of the Detroit auto show. It will go on sale in the U.S. this summer with an expected slight price increase, upgraded equipment, and revised front, rear and interior styling. The same models -- a GLA250, GLA250 4MATIC and Mercedes-AMG GLA45 -- carry over. 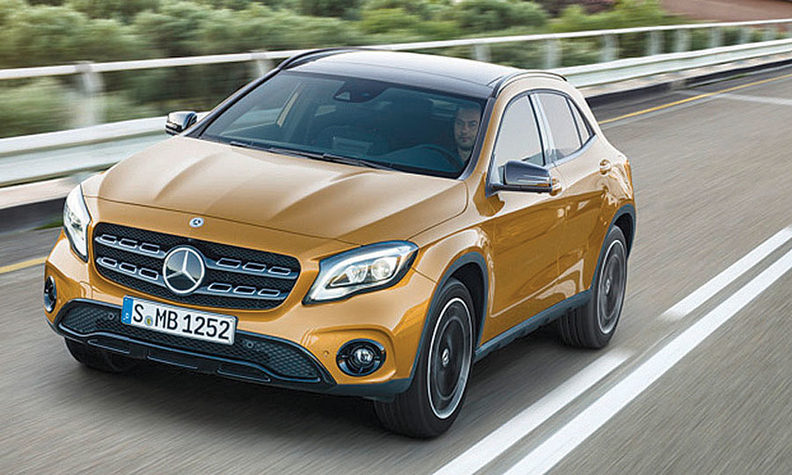 The GLA gets redesigned front and rear bumpers, new wheel designs and a new instrument cluster design. An 8-inch high-resolution display screen and rearview camera are now standard. That may be most apparent in the GLA45 with its reshaped front apron, new air intake grilles and a front splitter insert in silver chrome. The exterior changes, which also include a new spoiler lip on the roof spoiler, help improve the crossover's aerodynamics and driving dynamics. Pricing on the GLA250 models is likely to increase by around $500 for each, according to a Mercedes source, but that's preliminary and could change. When the GLA went on sale in the U.S. in late 2014, Mercedes aimed to bring additional younger buyers into the brand by introducing an entry-level vehicle with premium features at a price point more competitive than its previous smallest crossover. In the vehicle's first two full years on the market, Mercedes has sold around 25,000 GLAs annually. U.S. sales dropped 4.1 percent in 2016 to 24,545 vehicles, even as overall crossover and SUV sales surged for Mercedes-Benz and the industry. Mercedes increased incentives on the GLA in 2016 with the average dollar amount spent per vehicle at $3,242, up from $2,965, according to AutoData Corp. The incentive amount rose steadily as the year progressed, hitting a peak of $4,329 in December.